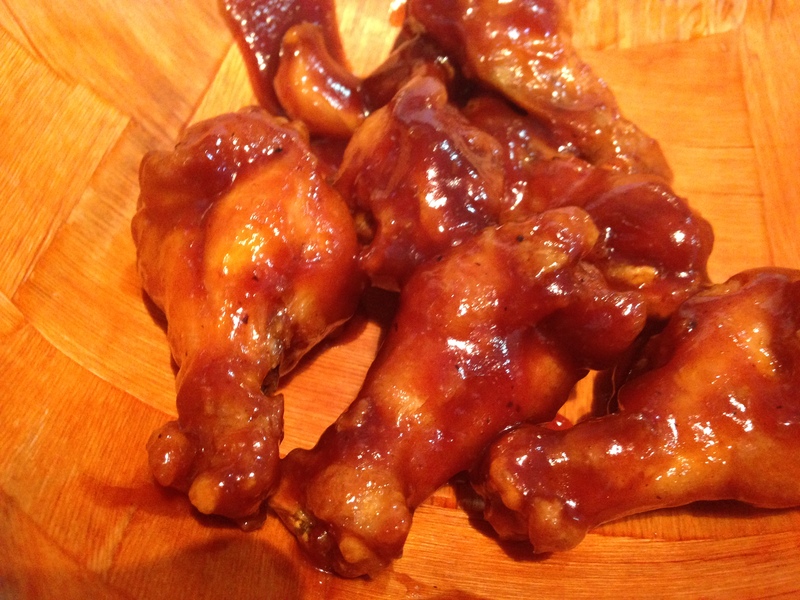 Along with burgers and fries, there may be no more popular sports bar food than chicken wings. Every restaurant has the own unique take, tossing them in ever more original sauces and seasonings. And while dozens of Berks County restaurants are tossing wings on a nightly basis, there are very few that are doing them as well as Dino’s Wings and Thing’s in Temple. Dino’s is more sports shrine than sports bar. Photos and memorabilia from all of the local sports teams dot the walls, but it is the sport of kings that holds the throne at Dino’s. Before lending his name to his wings business, Dino Iacarrino was stepping into the ring in the local gyms, where BoxRec.com lists his career record at 5-2 with one knockout. Along with autographed posters of Muhammad Ali and “Raging Bull” Jake LaMotta is a faux Sports Illustrated cover showing a young Dino in training. And while he may never have become a champion in the ring, Dino has established his business as a champion among local eateries. So we sat down in a booth, Muhammad Ali standing tall over a fallen Sonny Liston on the wall, with diamond plating accenting the orange paint. The service was surprisingly quick as our food was delivered in less than 10 minutes (our waitress was assisted by two adorable little girls who were tasked with bringing the empty bowls for our bones (and who were both excited to use the spray bottle on the dirty table behind us). With 24 wing flavors on the menu, decisions are difficult, but we managed to narrow it down to three flavors for this trip. First up was the creamy ranch. 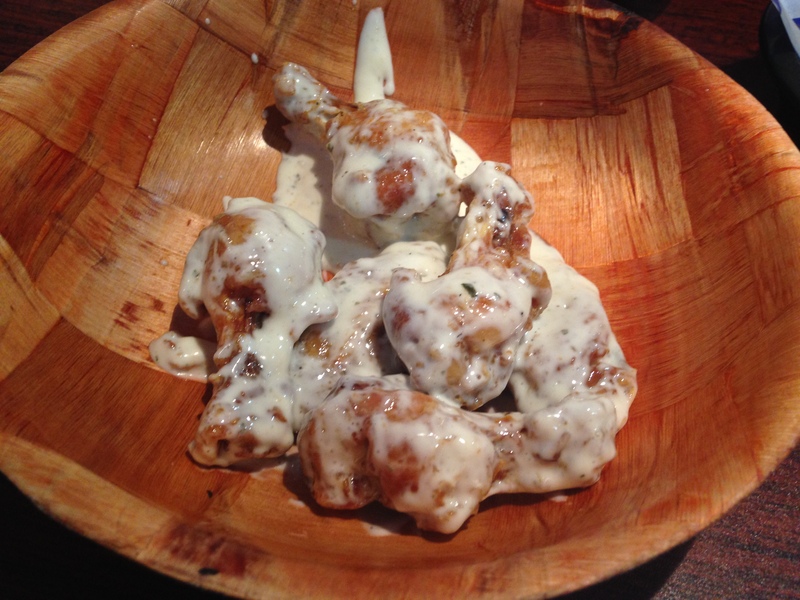 The wings were dripping with a thick coat of ranch dressing. Maybe it’s me, but I would say the dressing tasted a lot better on the wings than on any salad I have had. For the second choice, we went with the standard barbecue. Dino’s BBQ sauce is very sweet with just a little tang on the back end, definitely a winning combination on a wing. Last, and certainly not least, we went with one of the more original flavors: Montreal. 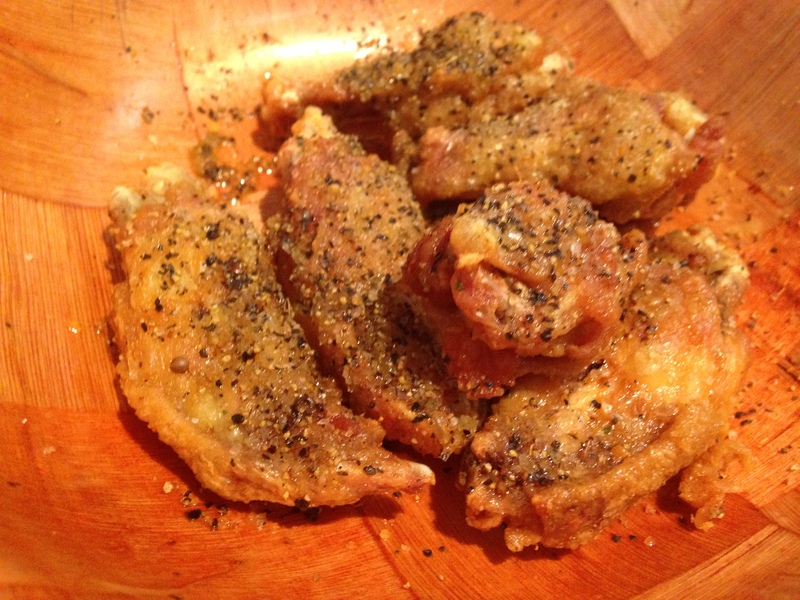 As you may guess, the wings were loaded in Montreal steak seasoning, which gave them a salty and spicy taste that was my favorite of the three. 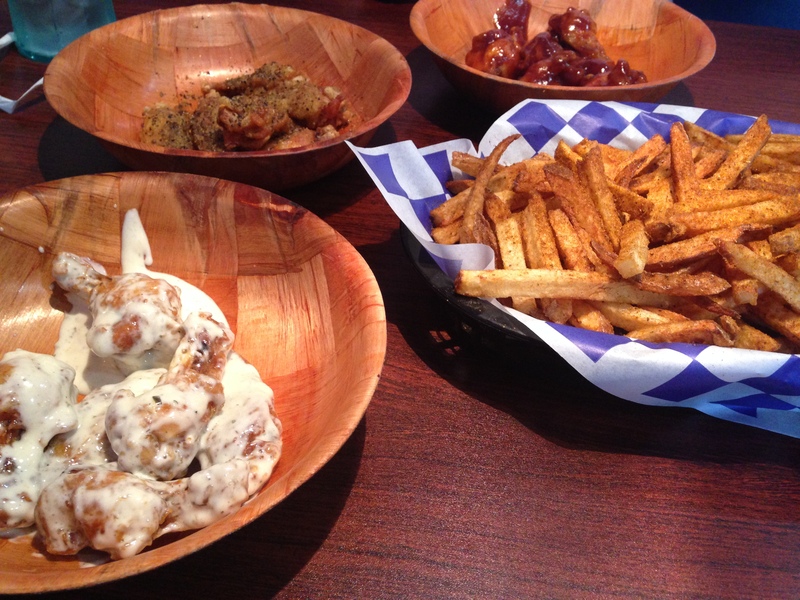 But as the name suggests, Dino’s Wings & Things is more than just wings. Other “things” on the menu include massive subs, six-ounce burgers, fried sides and a host of appetizers that include fries topped with 19 different topping options like chicken parm, cheese steak, and the mac daddy (fries topped with a six-ounce burger, American cheese, onions, pickles and Thousand Island dressing. 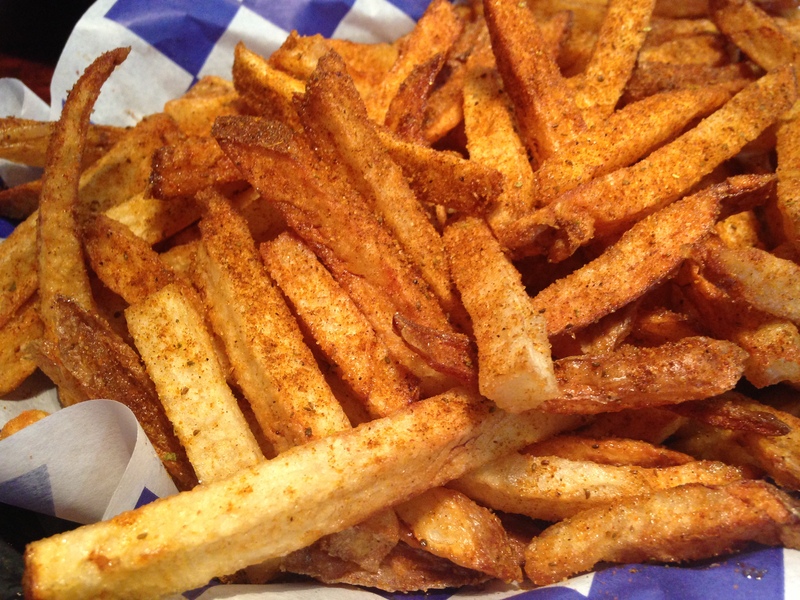 But when you’re loading up on wing flavors, a simple order of Old Bay fries is perfect. Besides, you need something to soak up all the extra sauce from the wings. For our 18 wings and Old Bay fries, we paid just under $20.00, but if you are looking for a little better deal, Dino’s offers 25- and 50-wing samplers. You can also stop in on Wednesdays and enjoy all-you-can-eat wings for $10.99 or visit on Thursdays for build-your-own burgers with bottomless fries for $8.99. About the only piece of boxing memorabilia not hanging in the dining room is a championship belt, though you could argue they deserve one. Because while Dino may never have been a champion in the ring, Dino’s has certainly earned a place as a champion of wings.